For Emily, accepting Philip’s proposal was an easy way to escape her overbearing mother. And when Philip dies on safari soon after their wedding, she feels little grief; she had barely known him. Now, nearly two years later, she learns that her husband was very different from the man she thought she had married. Eager to find out more, Emily begins to study the priceless Greek statues her husband collected. Her search leads to the British Museum, where she discovers that a ring of forgers is stealing artifacts from the Greco–Roman galleries. Solving the crime will lead to more discoveries about Philip and cause Emily to question the role in Victorian Society to which she, as a woman, is relegated. (Source:Goodreads). 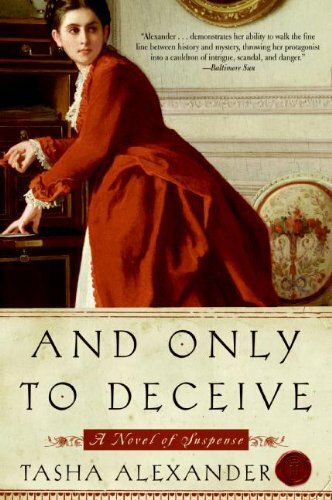 And Only to Deceive is the first book of the Lady Emily series, which is a favorite of mine. Emily is a very strong female character who learns to think and study for herself after her husband’s death. Bravo to Tasha Alexander! When mysterious circumstances are unearthed about her husband’s death, Emily has to decide who to trust: Andrew, the man who seems to be in love with her, or her husband’s best friend Colin. The Greek antiquities her husband collected become fascinating to Emily, and she starts studying them as well as Homer, the Greek language and other studies. I love that she takes that on for herself, she is such a great character! Speaking of great characters: Colin…oh Colin. He is magnificent book crush material. Strong, smart, handsome, rich and capable. He is also understanding and even approving of Emily’s attempts to release herself from the woman’s normal role: even when she stays in the room with the other men for cigars and port after dinner! Shocking! But, he is definitely man enough to handle Emily in all her port-drinking-Lady Audley’s Secret-reading glory, if Emily wants to let him handle her, that is. When And Only to Deceive ends, the jury is still out on that. She won’t give up her new found independence easily. And Only to Deceive is the beginning of a fantastic historical mystery series, with dashes of romance of course. I definitely recommend picking them up! Tasha Alexander really knows how to create fantastic characters and captivating stories! Oh, I need to add these to my absolutely need to read ASAP list!! Hi! I read this review when you posted it and I am now currently reading And Only To Deceive. I just HAD to read it after reading this review! I'm loving it so far and just wanted to thank you for the rec!